When you are looking for children's fashion you ideally want something good value, hard wearing yet stylish and Yellow Mellon provides just that. They design, manufacture and retail clothing from birth to 13 years of age (some goes up to 16 years) allowing them to keep the costs low for you. They also have a lovely range of brands available including Hello Kitty, Disney and Spiderman to keep your little character fans happy and a selection of toys and accessories, all at affordable prices, to keep you smiling too. We had the chance to select outfits for the Mini Mes to review to see just how good their products were. I selected a long sleeved top and some lace flack print leggings for Minxy to try as they are very much her taste. The sizing was spot on for her yet they still had a bit of room for growth and both items were great quality. The leggings are soft to the touch and the detailing is superb and intricate. The print on the top was great, it didn't alter after a few washes so I think it will last well. I feel this are great value for money as the entire outfit would only cost £12.98! 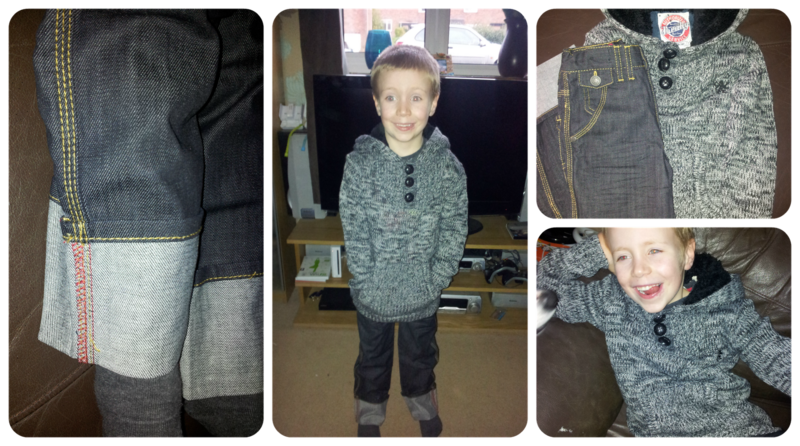 For Jamster I selected a stunning wool blend grey marl hoody and a pair of black turn-up jeans. The hooded jumper is fantastic, it features three chunky buttons to the front which are perfect for little hands, a pocket to keep hands warm and a fleece lined hood which is super soft and snug. Jamster loves this, it's hard to get him to take it off! It's stylish and looks a lot more expensive than it actually is at £13.99! The jeans have an adjustable waist which provides the perfect fit for his small waist and the stitching is very tidy. The deep pockets, two of which are buttoned, are great for storing all the bits and bobs he stores away. As well as every day clothing Yellow Mellon offer a range of nightwear, including onesies, and occasion wear. I feel that the quality of their products and value is superb. I will be shopping here in the near future. We have a £20 voucher up for grabs for one lucky person to spend on their little one(s). You can enter using the Rafflecopter entry form below before 8th December 2012. I would put my voucher towards the Girls Layered short sleeve dress with waistband and floral details in Red/white for my youngest daughter. It is my sister's wedding next Spring and I think my daughter would look lovely in this! My daughter loves Moshi monsters and minnie mouse at the moment. Girls 1D Photo Printed Pyjamas...My girl loves One Direction!! Hello Kitty for my daughter and anything Mario or Sonic for E.
Lego is Owen's favourite or hello Kitty if it's Holly. Thomas the Tank PJ's to match his new Thomas themed bedroom! Baby Girls Little Prince Gift Set Pink for my boyfriend's cousins new baby girl! My daughter loves minnie mouse character clothes. I think I am in love with this dress!! Thanks for the giveaway, just discovered Yellow Melon and some fab stuff there, off to have a browse now. Mickey Mouse PJ for my lil one. Really decent prices - especially if you are being nagged for the latest thing and just know the novelty may wear off quite quickly! I would get the boys converse star logo printed T-shirt in Red. I'd get the boys Freaky Commando Aviator Jacket. Something nice for my gorgeous little baby! I love this http://www.yellowmellon.com/elegant-baby-girls-special-occasion-dress-white-maroon/ for my granddaughter, for the party season.